Passengers furl a sail as Capt. John Foss, inlaid shirt, hauls in a line. / Something to talk about, including yourself. / Romantic notions of life under sail. / Any desire for luxury. / The idea that you’re in charge. 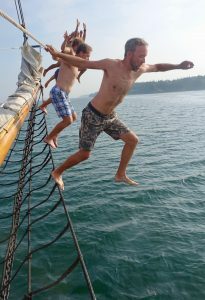 Come up the gangplank of a windjammer and you become a member of a new community that gets up pretty much with the sun and stays up well after sunset. Before each meal, members form bucket brigades to hand up from the galley (kitchen) the plates, bowls, silverware and platters of food. After the meals, three or four folks head down to that too-warm galley (its woodburning stove to dry the dishes. Passengers and crew members leap from the bow into the 64-degree waters of Penobscot Sound.-burning stove is designed for ships) to dry the dishes. On deck, you can join others to haul, hand over hand and in unison, the thick lines (ropes) that raise and lower the sails. You can help furl (fold) the sails as they are lowered. Heck, you can even help row your new pals to and from shore, to visit the picturesque villages of clapboard and shingled buildings. 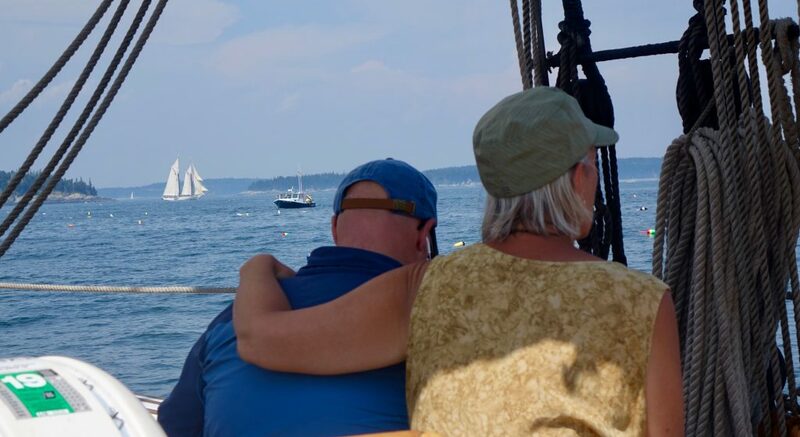 Or pull on an oar to a highlight of every windjammer cruise, a lobster bake on an island beach (Maine supplies about 85 percent of the lobsters eaten in the U.S.). Or you can do none of these daily tasks and simply loll about (see above: “something to read’’). There are no requirements to join in, no penalties — except you’ll miss some of the fun of shipboard life. “The communal spirit is greater than I had expected,’’ said John Gauger one evening earlier this month. “Look how many are out on deck two hours after dinner (it was 16 out of 21 passengers).’’ It’s likely some of the enjoyment was fueled by the drinks passengers had brought aboard the American Eaglefor this three-night trip. She referred to the exaggerated slant toward the 64-degree waters that washed through holes at the deck’s edge and even splashed folks sitting on the boat’s high side. Foss took two years in the mid-‘80s to re-fit the 92-foot fishing schooner that launched in 1930. American Eaglesleeps 26 in cabins that can charitably be termed snug. There is no air conditioning; each cabin has a small but efficient three-speed fan. There are two bathrooms and a single shower room. There are themed cruises – whale watching, races, leaf peeping, gatherings of windjammers, and trips to Canada. First Mate Christa Miller-Shelley starts to climb the rigging. Only two of the 21 passengers were youngsters, the 23- and 19-year-old children of John Gauger and his wife Barbara. Most passengers were middle-aged, such as 41-year-old public librarian Craig Smith, on board with his brother Brad and their father, Michael. Always time for a quiet moment aboard a windjammer. 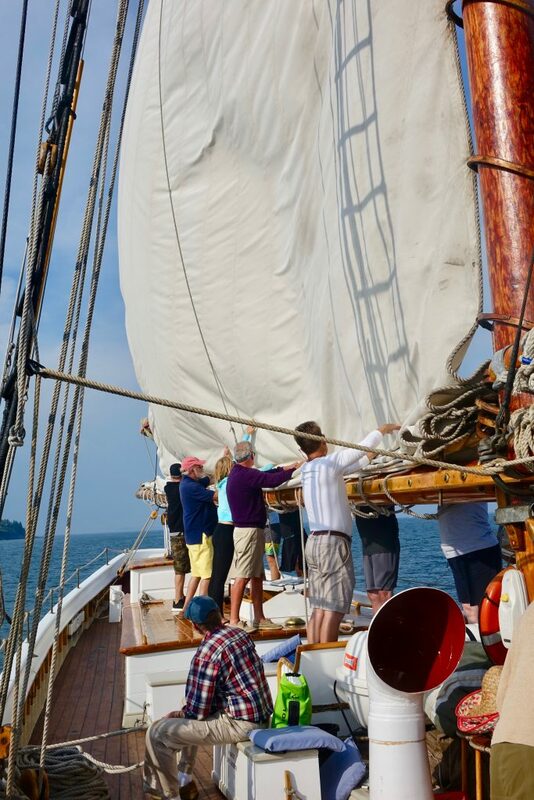 Like most of the eight vessels in the Maine Windjammer Association, American Eagle’sseason runs from late May into October. The fleet’s cruises run two to 11 nights, with three and four nights the most popular. There is a wide variety of all-inclusive pricing depending on the number of nights and vessel. Prices start at $525 per person for a two-night cruise, six-night trips range from $935 to $1,938. Average pricing is about $220 per night. For more information, go to www.sailmainecoast.com. ; call 800 807-9463.